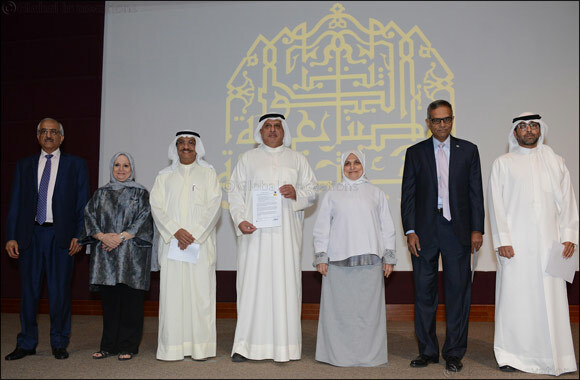 Kuwait City, 2 October 2018 - Under the auspices of Her Excellency Mrs. Hind Sabeeh Barak Al-Sabeeh, Minister of Social Affairs and Labour and Minister of State for Economic Affairs, the Women's Research and Studies Center, College of Social Sciences at Kuwait University convened the launch of Women’s Empowerment Principles in Kuwait on 1 October 2018, at the Kuwait Chamber of Commerce and Industry This initiative was designed to mobilize the Kuwaiti private sector to promote, support and accelerate gender equality between men and women and women’s economic empowerment, in alignment with the global 2030 Agenda for Sustainable Development. The high-level event was launched in partnership with the General Secretariat of the Supreme Council for Planning and Development, the United Nations Development Programme (UNDP), and the United Nations Entity for Gender Equality and the Empowerment of Women (UN Women). The event was held under the framework of Sustainable Development Goal 5: achieve gender equality and empower all women and girls.. In her keynote speech, H.E. Mrs. Mrs. Hind Sabeeh Barak Al-Sabeeh, re-iterated her commitment to women’s economic empowerment as a strategic government goal to ensure sustainable growth by unleashing the potential of women, who represent 50% of the local talent. ‘To advance our economic growth and continue to excel in an increasingly more competitive world, it is paramount that we open up opportunities for women, and men, to address society’s most pressing challenges and enable solutions that would take our country forward. More women mean smarter business and stronger economies, she concluded. Dr. Tarek El Sheikh, UN Resident Coordinator, and UNDP Resident Representative in Kuwait congratulated the participating stakeholders for their solid commitment to substantiate one of the key pillars of the National Development Plan set forth by the government under the effective leadership of the President of the Supreme Council for Planning and Development, Sheikh Naser Sabah Al-Ahmed, First Deputy Prime Minister and Minister of Defense and under the direction of the Minister of State for Economic Development. Dr. El-Sheikh reiterated that the implementation of the strategy, which is fully supported and sponsored by the General Secretariat of the Supreme Council for Planning and Development, will take the country one step closer to achieving SDG5. Speaking further on the WEPs, Dr. El Sheikh added: ‘The United Nations is very pleased to be a party to this multi-stakeholder platform and to see this high level of committment to the economic empowerment of women that would help accelerate Kuwait’s economic, political and social progress. Increasing women’s participation in businesses will lead to better development outcomes for families and communities”. Ms. Nicolla Hewitt, UN Women Senior Advisor noted, “Leading private sector companies in the State of Kuwait are joining the global level initiative, and signalling Kuwait’s commitment towards achieving the Sustainable Development Goals for the benefit of women, men and the community as a whole, and using the WEPs as a powerful tool to achieve this”. The workshop is a capacity building and knowledge exchange platform for private sector companies. The workshop will be led by an expert from UN Women, who will explain the steps required for the implementation of the principles within the organizations in different sectors and scales to ensure women’s empowerment in their workplaces, fields of activity and social responsibility projects. Women’s Empowerment Principles were launched by UN Women and the UN Global Compact in 201¬¬0 to offer a platform to mobilize business action to advance gender equality and women’s empowerment at the workplace, marketplace, and communities. The WEPs provide a set of seven Principles through which businesses can analyse their current initiatives, benchmarks and reporting practices, and then tailor or establish policies and practices to achieve them.